Vest Weights from Fun and Function are an essential part of weight vests. They are designed to be used in several weighted vests also made by Fun and Function. Each weight consists of steel pellets securely held in polyester covers. These weights will fit perfectly in the inside pockets of the weighted vests. Weighted vests can be used as part of a therapy strategy that deals with proprioceptive input. They are excellent tools for helping children with autism and sensory processing disorder. Use only with adult supervision and under the guidance of a therapist. HIGH-QUALITY CONSTRUCTION. 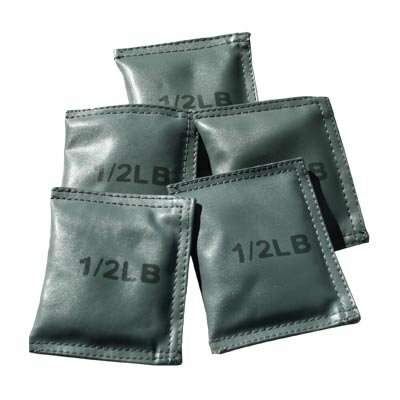 These vest weights are filled with steel pellets, encased in fabric covers to provide long-lasting strength and continual use. They're totally self-contained and extremely portable so you can take them wherever you need to go. DESIGNED FOR SPD THERAPY. Offering deep pressure to encourage calm, focus and attention, these weights are perfect for use as part of therapy strategies for kids and adults with autism and sensory processing disorder. CALMING BENEFITS. Ideal for use during focus times - such as test taking, working at a desk, doing homework or when listening is required - the additional weight in a vest can act as a filter to help engage the mind toward more important matters. 5-PIECE SET. The economical package includes five, ½-pound weights, each measuring 4" L x 3" W in size. As such, you can add up to 2.5 pounds of extra calming weight into any Fun and Function Weighted Vest, sold separately. DESIGNED FOR USE WITH WEIGHTED VEST. These weights will fit snugly in the pockets of a children's weighted vest like a glove, offering steady proprioceptive input to help children focus at school and stay calm in stressful, sensory overloaded situations.